A managed service provider (MSP) using Password Manager Pro to store shared passwords of their clients and technicians; has no access to the application inside the client's network while visiting them. Technicians working in DMZs with no access to the application's web UI. Go to Admin >> Integration >> Cloud Storage. In the page that loads, select Dropbox. Then, click the link - Test Dropbox Connection for this PMP Installation. This basically checks the proxy settings (if applicable in your environment) and does the necessary background processes to try and connect to the Dropbox app named "ManageEngine Password Manager Pro" created by PMP for this purpose. A successful connection will enable users to upload the encrypted HTML file to their Dropbox account. Then, click 'Save'. Dropbox synchronization will be enabled for users in your organization. Go to Resources >> Export >> Sync with Dropbox for Mobile Access. In the dialog box that opens, click 'Authorize'. A new window will open, asking you to log into Dropbox account. Once you log in, the page will display a request from Password Manager Pro to access its folder 'ManageEngine Password Manager Pro' inside your Dropbox account. Click 'Allow' to approve the request. A Dropbox code will be displayed as shown in the image below. Copy the code and navigate back to Password Manager Pro's active session in the other browser tab. Paste the Dropbox code in the displayed text field and click 'Save'. Now, click on 'Export' again and select 'Sync with Dropbox for Mobile Access'. In the dialog box that opens, set a passphrase for that HTML file that you're about to export. The file will be encrypted using AES-256 bit algorithm with the passphrase you supply here. Then, enter your reason for export if mandated by your Password Manager Pro administrator. Click 'Proceed'. Once the HTML file has been successfully synchronized, Password Manager Pro will shortly display a message at the bottom left corner of the UI. You can click on the message or directly access your Dropbox account to check if the file has been synchronized. 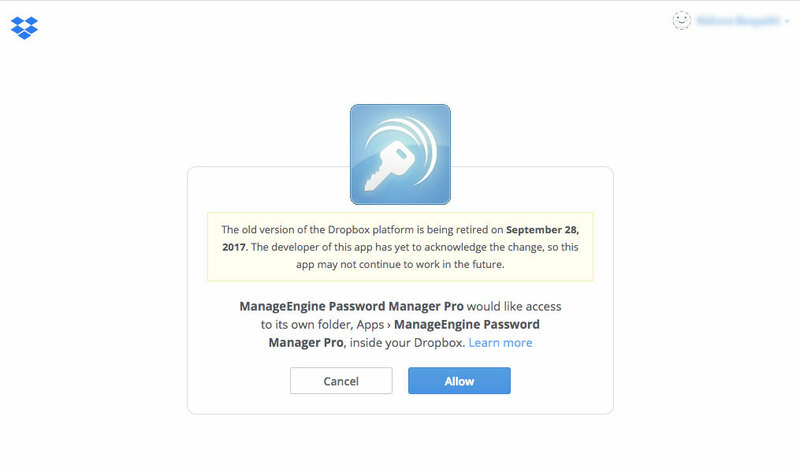 In your Dropbox account, the encrypted HTML file will appear under a new folder created in the name of ManageEngine Password Manager Pro. In the page that loads, select Amazon S3 and click 'Save'. Amazon S3 synchronization will be enabled for users in your organization. Go to Resources >> Export >> Sync with Amazon S3 for Mobile Access. In the dialog box that opens, you have to provide the following details: Access key ID, Secret access key, and Bucket Name. Access key ID and Secret access key are user security credentials that are automatically assigned to you when your AWS administrator creates your user profile in your organization's AWS account. The credentials are usually sent via an email to your inbox. In case you do not have access to your Access key ID and Secret access key, contact your AWS administrator. Bucket Name: Bucket Names are the names of the folder that you create in your Amazon S3 account. Here, provide the Bucket Name of an existing folder. This is where the encrypted HTML file will be stored upon synchronization. After providing the required details, click 'Save'. Now, click on 'Export' again and select 'Sync with Amazon S3 for Mobile Access'. Click 'Proceed'. Once the HTML file has been successfully synchronized, Password Manager Pro will shortly display a message at the bottom left corner of the UI. You can click on the message or directly access your Amazon S3 account to check if the file has been synchronized. In your Amazon S3 account, the encrypted HTML file will appear under the bucket that you have specified earlier. 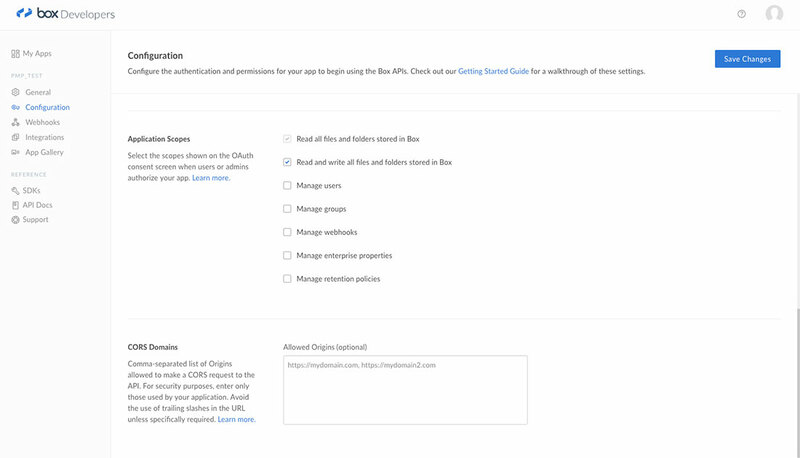 Go to Box Developers console and log in with your Box credentials. Once you log in, create a new 'Partner Integration' app. Name the new app as Password Manager Pro or any other name as desired and click 'Create App'. In the page that loads, provide your contact email and other basic details as required. Then, navigate to the 'Configuration' tab of the created app. Under 'Authentication Method', ensure that 'Standard OAuth 2.0 (User Authentication)' is selected. Next, copy the Client ID and Client Secret provided under 'OAuth 2.0 Credentials' section and keep them aside. You will be required to provide these credentials later in Password Manager Pro >> Admin >> Cloud Storage UI. Note: If you have high availability configured for your Password Manager Pro installation, during circumstances when the primary server is down and the secondary server is running, you have to change the redirect URL in your Box configuration accordingly for the synchronization to work. Finally, under 'Application Scopes' section, ensure that permission to 'Read and write all files and folders stored in Box' is checked. Navigate back to Password Manager Pro >> Admin >> Integration >> Cloud Storage. Select Box and enter the copied Client ID and Client Secret. Click 'Save'. Box synchronization will be enabled for users in your organization. Go to Resources >> Export >> Sync with Box for Mobile Access. In the dialog box that opens, click 'Authorize'. Box's login page will open in a new window. Log in with your Box credentials and in the page that loads, click 'Grant access to Box'. A message saying the authorization is successful will be displayed. Click 'OK'. You will then be automatically redirected back to Password Manager Pro's UI. A message saying the authorization is successful will be displayed. Click 'OK'. You will then be automatically redirected back to Password Manager Pro's UI. Now, navigate again to Resources >> Export and click on Sync with Box for Mobile Access. Click 'Proceed'. Once the HTML file has been successfully synchronized, Password Manager Pro will shortly display a message at the bottom left corner of the UI. You can click on the message or directly access your Box account to check if the file has been synchronized. In your Box account, the encrypted HTML file will appear under a new folder created in the name of Password Manager Pro.